I rarely use my Perfect Plum, but with the new Paper Patterns it was a great time to pull it back out! The stamp image is from Say With Scallops (this year's Ronald McDonald set! ), which works perfectly with the new scallop square punch. The "hi" image is raised with dimensionals. Simple and fast note card! 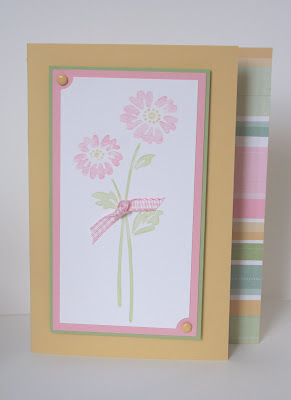 Another simple note card with the Parisian Summer papers! This is a great pack with such a nice color combo that I'd never pull together on my own. Great time to put my much neglected Pale Plum to use! It is paired with burgundy and apricot ribbon. 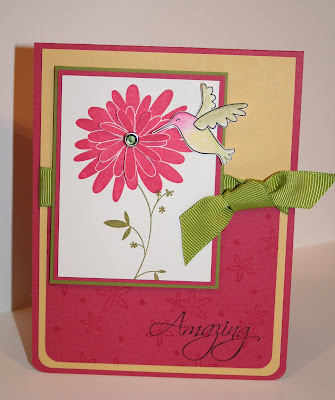 The flower image is from the Together Forever stamp set. 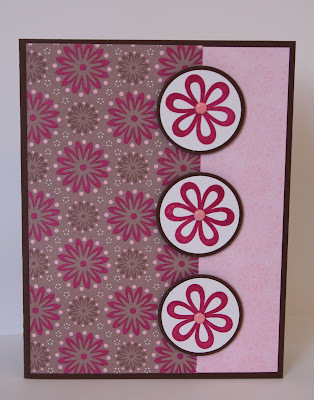 Next up is a card using one of my favorite sets these days .... Upsy Daisy. 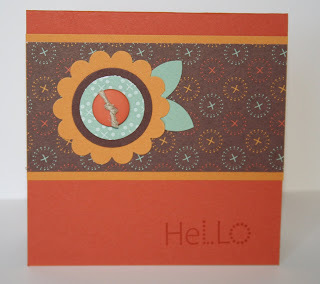 The Haiku paper pack is great for fall! More Mustard, Old Olive and Tangerine Tango ... with vanilla ribbon and the scallop border punch. Some cards just look better with a square layout. So this is a little 4 1/2 x 4 1/2 card. Cut the usual way, just trimmed down on the end. The paper is from Autumn Vine in the new Holiday Mini catalog. 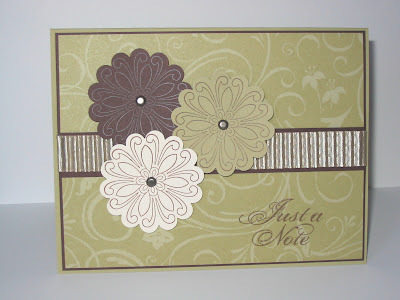 We used the scallop circle punch, 5-Petal flower punch, 1 1/4" circle and 1" circle punches. Buttons are from Earth Element with some hemp. Sentiment is from the "Hi & Hello" set. 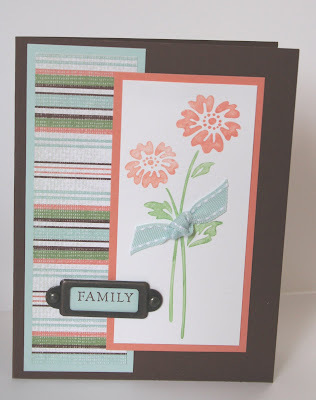 Next is a card that used NO stamping. :) This would be a great layout to use up left over scrapbook papers! 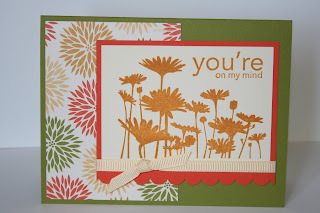 The Hawaii Papaya is such a fun paper pack for fall. The squares are with the 1 3/8" square punch. The Chocolate Chip card base is scored at 4 1/4" so that the matted section sits onto the 4 1/4" square. Then the Tangerine Tango striped grosgrain along the side, with a little white flower from the 3 Flower Punch with an Olive brad. And just in case 5 "entrees" weren't enough, we had a total of 8 this time! :) This uses the same type of paper pack as Hawaii Papaya, but is all in blues and greens ..... Maine Blueberry! 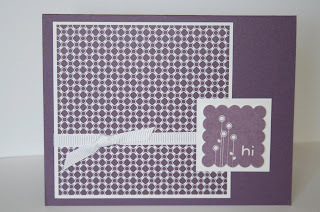 Not Quite Navy paper and brad, Old Olive ribbon, Cute & Curly stamp set with coordinating punch. 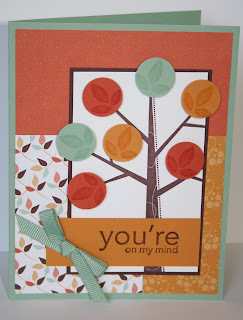 And the last card is using the new Seasons of Friendship set from the Holiday Mini with the coordinating Autumn Vine paper! This set is SO versatile. We'll be revisiting again next month at the next buffet with the winter theme! Can't wait. :) Card base is in Sage Shadow and we now have matching ribbon for that color! All the leaves were stamped with Versamark on Sage Shadow, More Mustard and Really Rust, then punched with the 3/4" circle punch and raised with dimensionals. The sentiment here is from the above set Upsy Daisy. As usual, we enjoyed much coffee while stamping and to celebrate the fall season we had my mom's Pumpkin Bread. It is the best! To care of some business, I'll post the recipe here. Hope you're able to enjoy some yummy treats with those you love this season. Mix all together well. Put into two greased & floured loaf pans. Bake 1 hour at 350 degrees. Pour glaze of milk, powdered sugar and melted butter & bit of cinnamon over bread while warm. Count calories at your own risk! I decided to get the Upsy Daisy set since it's on sale through September. It is easier to work with than I thought. You can do so many techniques with this stamp, but I kept this simple .. just stamp and then glitter. The new Parisian Summer paper is SO nice. Finally a paper combo with burgundy!, as mine has been quite neglected. 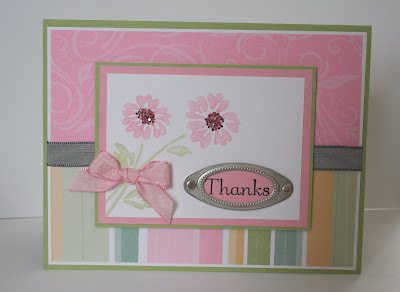 I really am liking the new soft Pink Pirouette color to work with! I've been waiting for a great cupcake set and was pleasantly surprised to find one in the new Idea Book & Catalog from SU! 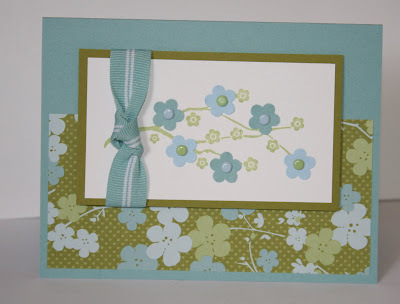 This is a simple card we did at my recent Papers & Punches class. The cupcake icing is finished off with dazzling diamonds glitter, which shows up much better in real life. 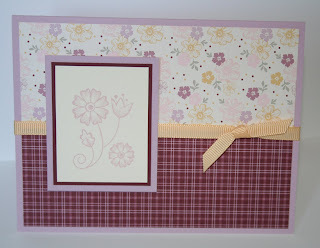 The papers are Sweet Always and the scalloped edge is made so easily with the new Scallop Edge punch! Yikes! .... two months of not posting. I doubt anyone still comes here! :) As many of you know, our family has gone through some major changes and find ourselves in a huge season of transition. While all that was going on, it was hard to even know what end was up some days. The Lord was certainly faithful and has been so gracious in showing us what's ahead. We are really excited and will share more soon. 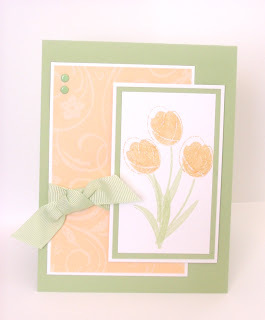 Details on this card: New Eastern Blooms stamp set with the Green Tea papers. I'm really enjoying working with the new In-Color colors. 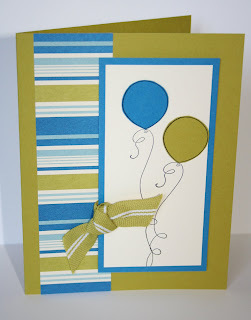 This one is Baja Breeze ... notice the coordinating striped grosgrain ribbon! There are accessories that match every new color! Makes things easy for sure. Image stamped in Certainly Celery, matted on Old Olive. 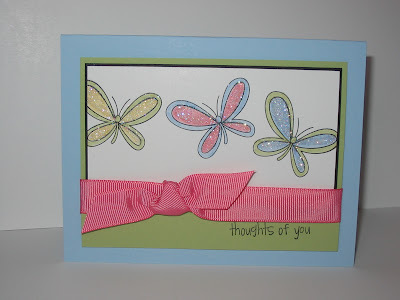 3 Flower Punch with Baja Breeze and Bashful Blue, then using soft subtles brads. You can also flip this card vertically for a whole different look. Here is another "entree" on the Card Buffet. It is so hard to believe this is my last event with the gals here. I've met so many great ladies! The card has the upper front piece sliced off. Then layered with the Groovy Guava prints papers, which retires very soon. Remember to stock up on any of the "In Colors" from this last year that you enjoy using! !, as they'll no longer be available. 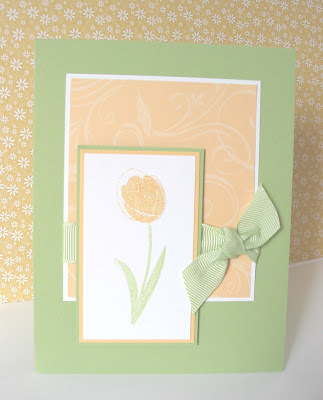 The flower is from the Stitched Exotics stamp set. I tried REALLY hard not to tie too many ribbons for this last event. I always get many fits for my ribbons. Ha. :) Notice on this one, we'll just overlap the ribbon and adhere behind the flower for fast leaves! 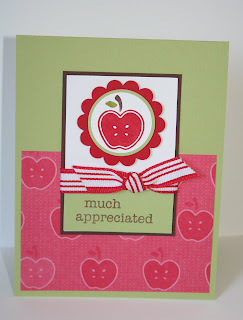 This happy little apple card is a sample of what's gonna be on the upcoming June Card Buffet! It's been a very fun event to plan. If you can't make it and would like a sampling of the buffet mailed to you, contact me via email about the options for that. Once again, using an image from the Tart & Tangy set with the coordinating Summer Picnic paper. Love this combo. With utilizing the punches, it makes for a fast card! 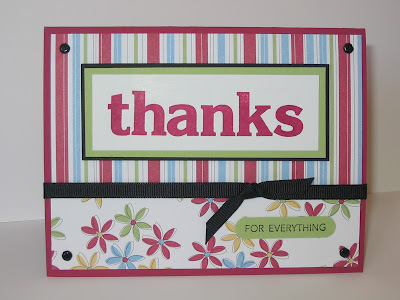 Sad that this "Much Appreciated" sentiment set is retiring. Be sure to check your retiring list before it's too late. 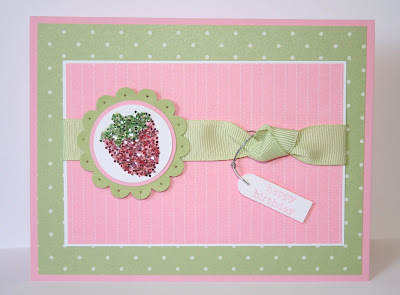 I needed a couple birthday cards, so decided to give my little strawberry stamp some "chunky sprinkles". If you don't have these, you really should get some before the current mini expires. They are so much fun to work with. The little strawberry is out of the Tart & Tangy set from the mini as well. Just marker, stamp, apply Tombo adhesive and sprinkle! The tag is made from the word window and then sliced off. I have found that "knotting" the bow and wrapping around makes a looser knot and "smooshes" better for mailing. Anyway, I've been busy preparing for my last event here in ND. Also tending to some thank-you's. Hope you're all enjoying a wonderful summer. Ours is one like no other, but we are well and enjoying the many blessings God has showered on us. 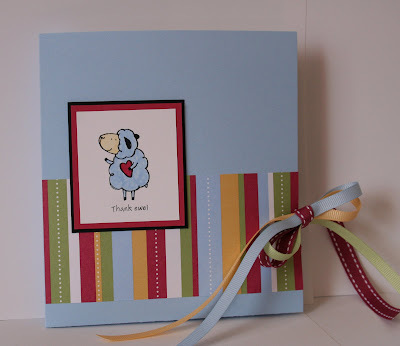 Here's a little "thank ewe" packet that I made up for a couple thank you gifts I needed. I love this simple packet holder. Super easy to make and it holds about 4 cards really well. 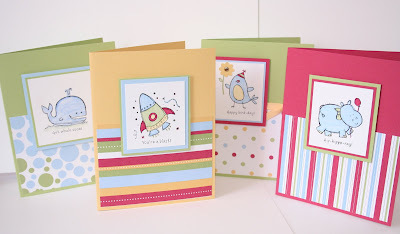 This card set is made with the Cutie Pie papers and the Pun Fun stamp set. I'm not usually the "punny" type, but this set is irresistible. As you can tell, I haven't had much time for stamping ..... so it might be slim pickin' around here for ideas for awhile. There seems to be a big event going on in our lives that just is taking all the time I have right now! :) We are just so thrilled the time is drawing closer that we can travel and bring our daughter HOME!! Announcing the newest member of the family! In case you don't know yet, I thought I should post here as well! Introducing the newest member of our family .... the most precious Maleah Faith Arsema Roberts! See many more pics and all the details over here! Well, since my computer has been quite ill, there's not been an opportunity to post! But it's on the mend now. 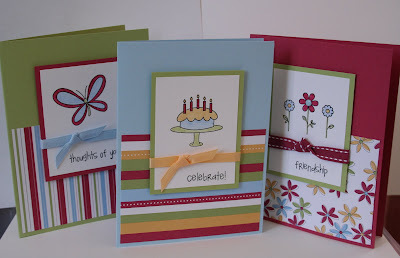 This little card group was one of the stations we had at my Spring Stamp-a-Stack this last weekend. It was great seeing everyone!! Wow, life is changing around here. I am definitely gonna be following a new routine/schedule in the coming weeks and will keep you posted as to when I resume events. This set is the Just Celebrate from the current mini-catalog. 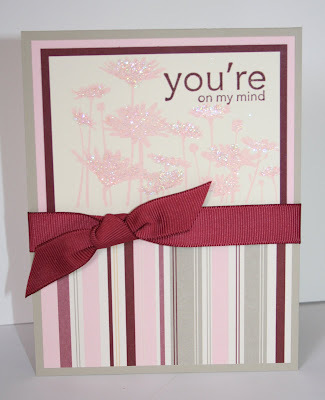 I love all the sentiments you get in this set! It's fun to just grab a paper pack and do up similar cards following the same design. Please know that while life is a changin' around here ... I am still available to answer your questions and/or replenish supplies for you. The best way to contact me is through email: robertsfamily@mlgc.com. 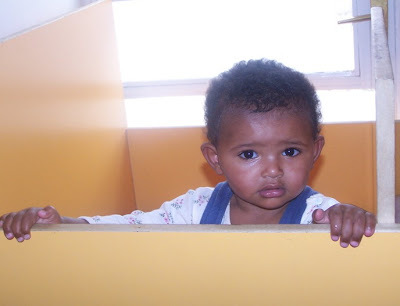 On Wed. (the 9th) we should hear how our court appointment went in Ethiopia. We are SO eager for this part of the journey to be over and to travel!!! To keep up to date with that progress, check in over HERE! Hello again ... good grief at this rate you'll give up on me sharing any ideas, since it's been a week between posts. Sorry ... just a bit occupied around here with "life" and my upcoming SAS. And since that's about all I've accomplished, I had to dig to find something to share with you today. 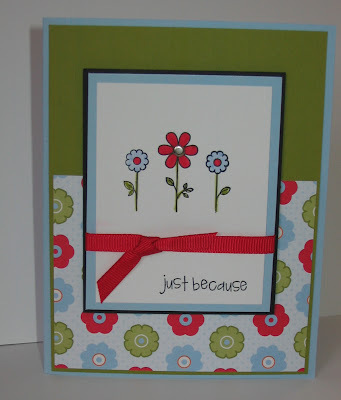 This is a card I just did in bulk for my aunt's recent order for the Stamp a Child Home project. My "rules" for her generally are "hearts and glitter". I thought I'd used up all of my heart options until I remembered that the Priceless set has a heart in it! ... and it can be glittered! So there ya have it. This one is in Rose Red and I did another batch for her in Amethyst. The prints papers came in very handy for quick backgrounds. 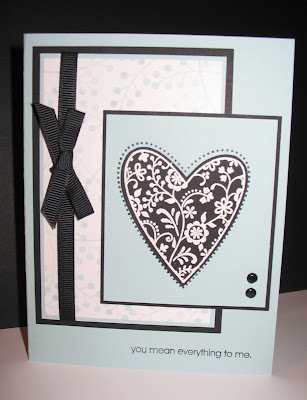 The inside of the card is lined with whisper white, then a heart stamped on the lower left corner. I used Tombo glue to adhere the glitter as I wanted it raised just a bit. Worked out very well. Happy Monday!, and a special hello to my "Moments in the Making" gals. 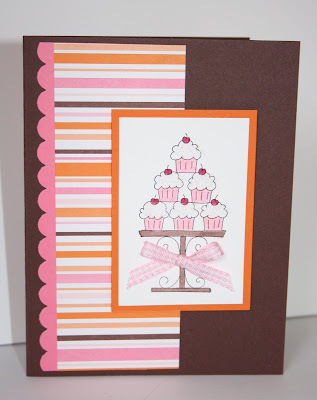 Hope you're enjoying working with some of the great goodies in the new All Occasions Mini! 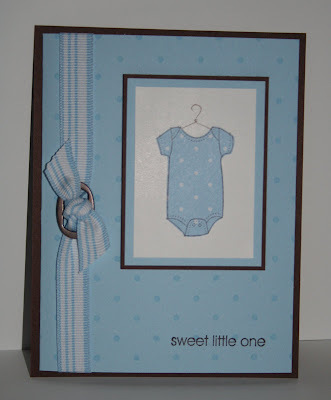 I love the little "onesie" stamp out of the "By Ones & By Twos" set. I stamped the onesie twice. First on the white cardstock, then on a piece of prints level 1 hostess pack paper. Just cut out and adhere on to the first image. The Polka Dot background is done with versamark. Don't forget about my upcoming Spring Stamp-a-Stack. You may come for a special price, being in my group. This will be my last event for awhile as we get our growing family all settled in together. I've sure enjoyed working with this Always set. It is so versatile! I used the "twig" type image with soft sky to make the background paper. Then the heart image is actually stamped twice. Where you see the dotted part, that was stamped with black staz-on. Then I embossed the heart on another piece of black paper, cut out and mounted to this soft sky piece. This would not be considered a "fast & easy" card but I was happen with the end result. Some black grosgrain and brads finishes it off. Yet another card with the Live Your Dream set! This features the new Afternoon Tea paper, which includes some great prints! Since the papers uses the In-Colors that have no markers, I just used re-inkers with my blender pens to ink the images. Worked great. Aged Copper hodgepodge goes so well with the chocolate chip. Just a bit of stitched Soft Sky ribbon finishes it off. I love the Fundamental Phrases set for sentiments. So many of them work with word window punch as well. Oops!, I didn't realize it had been several days since posting anything here. Guess I've been a bit pre-occupied. Let's see .... 75 designs for a gal in IL, 46 cards for my aunt in CA, a baby shower, normal family life ... oh and I had a class in the mix of all that! Hhmmm, makes me wanna take a nap thinking about it. Ha. Since it's also a Monday!, it's time for "Monday Moments" as well. So for you Moments in the Making gals ... be sure to check your email for my upcoming Stamp-a-Stack info. And since you're a member of my group, note that there is a special price for you ($10), so come join in on the fun! Anyway! ... here is a little card from my last class. 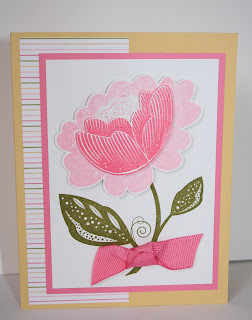 We used the Pretty Amazing set along with the Pretty Petals coordinating background stamp. It's a must have!! This background goes with so many of SU's sets. The little hummingbird is just colored with chalks. Pink taffeta ribbon and rhinestone circle brads are the accents. 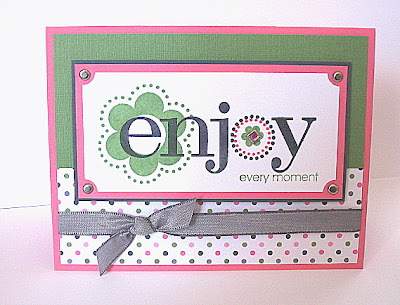 Another card with the new Live Your Dream set from the All Occasions mini! Love all the things you can do with this flower set! Notice the new "chunky sprinkles" from the mini as well. FUN stuff! I just used some Tombo glue. This card also shows the new Styled Silver hodgepodge hardware. I have found the perfect ribbon for all you "ribbon weary souls" out there! .... taffeta! You HAVE to try some. It is SO EASY to tie! Perhaps you've caught on to my theme lately ... Clean and SIMPLE! Sometimes less is more. I must confess, I purchased this new Live Your Dream set in the All Occasions mini purely because of that flower duo in it! I could just imagine a little ribbon glue-dotted to the center. 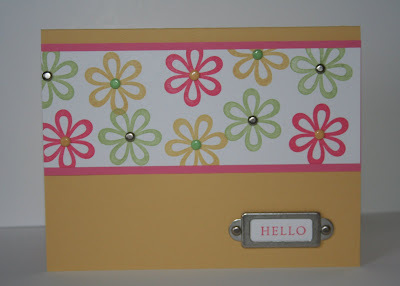 Again, I pulled the color combo from the Spring Fling DS papers. There was a little white space on the two corners, so I used the ticket punch and added soft subtle brads there. On the layout, I just cut off 3/4 " of the saffron and then used a 1" piece of the DS papers. I especially like using this kind of layout with striped papers. OH!, the flowers ... they are markered with pretty and pink, saffron, and celery markers. After you color with the markers, "huff" on it to moisten and stamp. Then just a bit of the pink gingham ribbon is tied for the center. More to come with this same stamp set tomorrow! 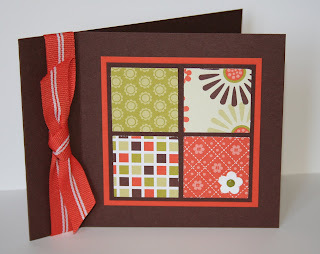 It's going to be a fun quarter now that we can all order out of the new All Occasions Mini! These papers are so fun and fresh for summer. Simple layout today! I always reach for my punches whenever I can. So much faster than cutting everything out. This flower is from the Always set. I am realizing just how versatile that set is! I liked how the Berry Bliss papers worked with this flower. That's it for now ... I'm still working on a ton of designs to be shipping out this next week. Thanks for stopping by. Hello! ... we've been a bit distracted around here! We finally received the long-awaited referral call for our adoption!!! If you'd like to know more, you can read about it HERE! Now we head into another dreaded wait for a court date, then we wait to pass court, then we wait to travel. We'd appreciate your prayers! Thought I should at least leave you with something on here, so this is a sample with the Pretty Amazing stamp set that I just purchased. I'm still doing design work for our Stamp a Child Home project. Okay, at the risk of boring you, I'm posting another card using the same set as yesterday. :) Have I mentioned that I LOVE this set? ... Just Celebrate, in the new All Occasions mini. Simple and fast card. 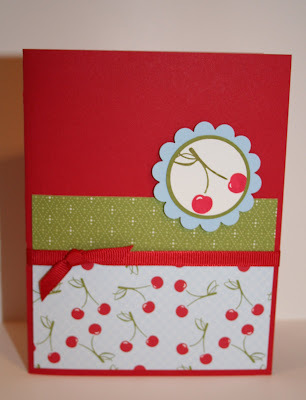 It uses one of the new paper packs, Summer Picnic. So fun and fresh! As I shared in the Welcome of this blog .... Monday Moments are dedicated to my wonderful 'lil "Moments in the Making" group! Since we are quite spread out across the miles, I wanted to have a place that I could post some things with them in mind. So here goes . . . . ! Okay everyone, hope you have a wonderful week. I've been getting a ton of stuff ready to send off to MN for Stamp a Child Home. So my house is needing some MAJOR attention!! Just a simple card today. This is using the Kind Thoughts set from the spring catty. The image shown here matches up with the scallop punch! Easy! The DS prints papers make such fast backgrounds. This one is River Rock. The ribbon is from the Beach Front ribbon originals. Sentiment is from Elegant Cheer. Hope you have a Happy Saturday! Okay .... time to be practical .... loved that blog template with the fun colors and flowers but it made my eyes go wonky when you're trying to look at the cards. So ... I'm going plain. Plain isn't always bad. Ha. I recently got the Enjoy Every Moment stamp set. It's a very versatile set. I can think of many occasions this would work for, as it comes with several different sentiments. Anyway, I paired it up with the Crew Girls scrappin' kit. LOVE this color combo in the kit. The Wasabi here on this card is the textured paper. The dotted print is from the scrap kit. Basic Grey taffeta ribbon (this is SO easy to tie!). Silver brads and a square rhinestone brad from "fire squares" finishes it off. 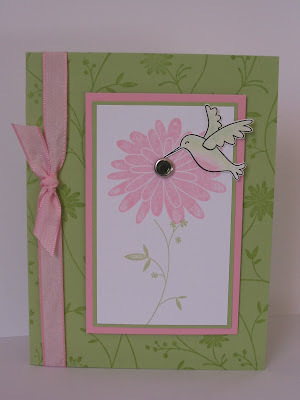 This card was designed for my recent Boho Blossom & Bloom class. LOVE the Berry Bliss papers in the Spring catty! They work great for guy & gal cards, which is important since I have both! 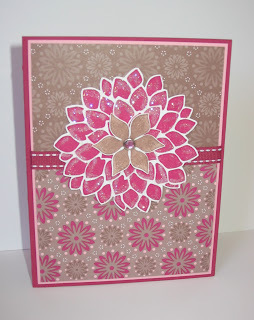 We started with a Purely Pomegranate base, layer of Pretty in Pink and the Berry Bliss papers. The big flower from Fabulous Flowers is stamped in Pomegranate, then the small flower is done in cocoa. For accessories we used the stitched Pomegranate ribbon and ice circle rhinestone brads. My pink are all gone now .. how sad! I need to figure out something to do with the rest. Of course we needed to add some glitz, so after a quick application with a two-way glue pen and some Dazzling Diamonds glitter, it was good to go. Now that both sessions of the Boho Blooms class is over, it's time to get ready for next month's Eastern Elegance class! I can't wait for this one. We'll be doing a bunch of fun projects. Be sure to mark the date, Sat. March 8th! More details to come soon. One tulip is good, three is better! While I had the tulip out, I decided to make one more. On Wednesday of each week you can check out a wonderful sketch challenge on SCS. Love them! I decided to take a quick creative break and try today's sketch out with Garden Whimsy. Getting really tired of the frigid North!! ... time to break out the tulips, don't you think? Anyway, you should give it a try by clicking HERE! I used certainly celery, apricot appeal for my color combo. 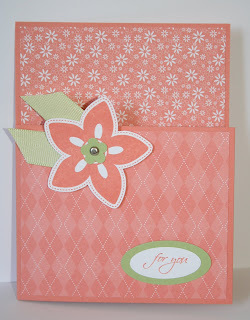 The apricot prints papers are in the great little Level 1 hostess pack! For a bit of shimmer, I used my Versamark marker on the tulip and then applied iridescent ice, then heat with your heat gun. Simple and fast card today! Welcome to "Moments in the Making"! 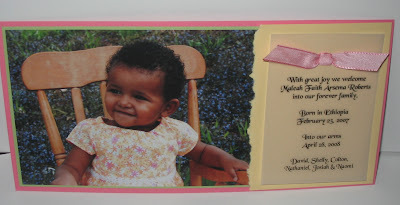 Some years back, I was introduced to the creative world of scrapbooking and card-making. While living on a frugal budget, it was a challenge to keep a stock of supplies. 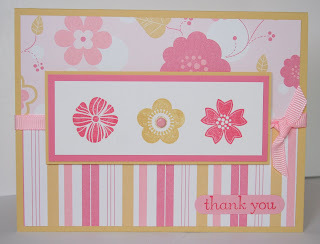 For the last couple of years I have thoroughly enjoyed being a Stampin' Up! demo. At the time, I had no idea that fun would grow! Since it has ... and since there are many miles separating our 'lil growing group ... I wanted to provide a creative spot where we could share ideas and inspiration. So here it is! ... the on-line home of "Moments in the Making"! Here I'll share info about upcoming events, creative ideas and on good days, maybe a bit of inspiration! So welcome! I am thrilled to have several gals now in my group. Some of us are hobbyists and some are working to fund their own habit ... oh!, I mean hobby!!! Since my family is in the midst of an amazing journey called adoption, the posts here might be limited at first. You can follow that adventure here! I hope to at least post something each Monday for my group, which will be called "Monday Moments". One of the biggest blessings to this creative little part of my life is building relationships with some wonderful gals, namely my customers. Many have become dear friends. So ... for you all, this will be one more place that hopefully you can enjoy some creative ideas, keep up to date on class info and various other things.